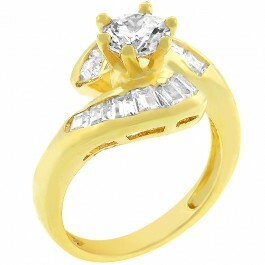 Wrap her finger with your love like this round cut prong set CZ is wrapped with channel set emerald cuts. It's a sure bet to get her arms wrapped around you forever. 14k Bonded Gold is achieved using an electroplating process that coats the item with heavy layers of 18k Yellow Gold and color-treated to a perfect 14k Hamilton gold color.